Scarlet is the best book I’ve read so far this year! It’s sad that I almost didn't even read it. The first time I tried to read this, I put it down probably without finishing the first chapter. I think I’ve figured out that I don’t like books written in dialect. It's the same reason that I couldn't get through Blood Red Road (maybe I'll get that on Audible now, too), even though I know that a lot of people love it. So I decided to try it on Audible, because I wouldn't have to read the dialect, just listen to it. Best. Decision. Ever. Helen Stern was a great narrator. She differentiated between the royal accent and the commoner accent. Also, her male voices weren't overdone. They were just a little lower than her female voices. She really drew me into the story and the time period. I’ll definitely be checking out other books narrated by Helen Stern. My knowledge of the Robin Hood story comes from Disney and Kevin Costner, but it's one of those stories that I've always loved. Gaughen kept the bones of the story I remembered, but added her own flair which kept me entertained. Although I will admit that I kept seeing Robin as a fox, John Little as a bear and, of course, King Richard as a lion. There’s one point where Gaughen had me laughing inadvertently when she described Prince John as a snake. I couldn't help seeing the snake from the Disney movie. Scarlet drove me a little crazy at the beginning. I don't mind headstrong, stubborn, strong girls. I can't stand stubbornness for no reason. Scarlet refused to eat in front of the boys because she didn't want to take charity and because they told her to. Biting off the nose to spite the face just annoys me. As the novel progressed, I began to understand Scarlet's reasoning and began to like her a lot more. By the end of the novel, I loved her ferocity, loyalty and bravery. She was definitely my favorite part of the story. I liked that Robin Hood wasn't portrayed as a perfect person in Scarlet. It made the story more interesting that he wasn't infallible. Robin’s Merry Band made a lot of mistakes during the book, and it made it seem more real. I don't believe I liked Robin Hood very much though. He acted liked he was better and smarter than everyone else. He also acted like he never made mistakes, but blamed Scarlet for all of hers. He wanted her to trust him, yet when she told him who she was, he got angry and mean with her. I also didn't really understand Scarlet's infatuation with Robin. It wasn't even that Scarlet was in love with the legend of Robin Hood, because she knew the man. By the end of the first book and into the second though, Gaughen began to bring the romance more to forefront of the story, and I began to appreciate it more. 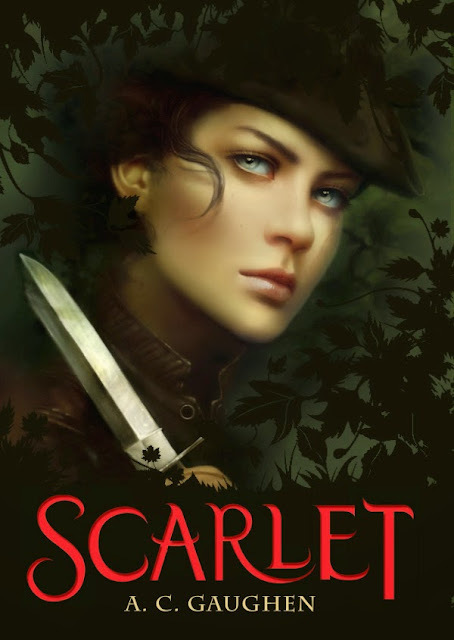 While a lot of Scarlet is all about the characters, it is also about the adventures. The novel does start out a little slow, but it isn't long before the gang is out thieving and rescuing people from the sheriff’s prison. With Gaughen’s master storytelling and Stern’s narration I felt like I was back in medieval England. Once I got into the story and past the dialect, I was hooked and never wanted to take my earbuds out. By the time I was probably halfway through the first book, I had already bought the second one on audio as well. And the Lady Thief might have been even better than Scarlet. I would recommend this to anyone who likes a good fantasy tale with a strong female lead and a little historical fiction thrown in. I would warn though that both books have a cliffhanger ending. I read Scarlet when it was first released and I loved it! When the author announced she had received an offer to make it into a trilogy I think I might have squealed. Many things that happened in The Lady Thief were hard to read about, but it was so good. I can't wait to read the next book. Yay! I am so glad you liked it...I cannot wait to read or listen to it! Awesome review! I liked Scarlet a lot, but I haven't found time to read Lady Thief. It IS on the top of my pile for this summer after my review obligations taper off. Paij, you HAVE to read it! I'm sure you'll love it. Paij, I agree! You do have to read it! It's so good!